A study of 57 major public sector units (excluding banks and NBFCs) shows their aggregate net sales grew 20.9% in the first half of this financial year from a negative growth of 22.7% in April-Sept 09. However, their operating profit growth dipped to 1.8% from 28.4%. A reason for this could be strong sales reported by majors like IOC, BPCL, HPCL, MMTC, GAIL(I) and BHEL. Aggregate sales of the 57 major PSUs rose to Rs 5.20 lakh crore, partially recovering from a decline to Rs 4.30 lakh crore in April-Sept 2009 from the level of Rs 5.57 lakh crore in April-Sept 08. Other income growth fell from 18.2% in the first half of last year to 0.7% in the first half of this year. Interest outgo went up 14.1% to Rs 5,594 crore during April-Sept10, after sliding by 32.6% a year earlier to Rs 4,902 crore, from a still unbeaten level of Rs 7,274 crore during April-Sept 08. On the profit front, the net profit growth of the companies turned out to be a negative 6.3% this time from a positive growth of 81.7% in the first half of last year. Operating profit margin (OPM) decreased by 255 basis points to 13.61% during April-Sept10a far cry from the 643-basis-points rise to 16.16% in April-Sept09 from 9.73% a year earlier. In the refineries sector, IOCs topline performance has been impressive. While sales jumped by 24.2% to Rs 1.49 lakh crore, the operating profit fell by 25.1% to Rs 5,969 crore during April-Sept.10. BPCLs top line increased by 32.4% to Rs 69,667 crore during April-Sept10, and operating profit by 9.1%. But its OPM decreased by 59 basis points to 2.78%. The company has been partially compensated for under-recoveries to the extent of Rs 5,319 crore, which includes Rs 2,371 crore received as discount from upstream oil companies. 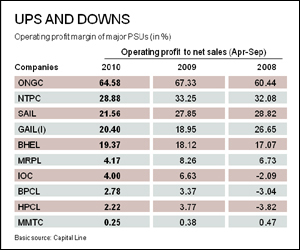 In the power sector, NTPCs performance was slightly better. While sales jumped 12.1% to Rs 26,653 crore, the operating profit dipped 2.7% to Rs 7,697 crore during the half year ended Sept10. OPM decreased 437 basis points to 28.88%. NHPC, another power company, posted a sharp 7.7% jump in operating profit to Rs 2,258 crore and a 2.5% increase in net sales to Rs 2,336 crore. In the trading sector, MMTCs performance was significantly better. While sales jumped by 70.6% to Rs 28,896 crore, operating profit rose 11.3% to Rs 71 crore during April-Sept.10. OPM decreased 13 basis points to 0.25% during April-Sept.10. STC is another trading company that posted an increase (1.6%) in sales to Rs 9,205 crore, but its operating profit decreased from Rs 129 crore to Rs 99 crore. Oil exploration company ONGCs performance was somewhat better. While sales increased 5.8%, operating profit jumped 1.5 % during April-Sept.10. OPM decreased by 275 basis points to 64.58% during April-Sept.10 from the level of 67.33% during April-Sept09.